Do you have an Incurable Case Of Wanderlust? There is no heart as restless as the traveler's. Curious explorers live in perpetual pursuit of the next adventure, whether it's merely skipping to the next town over in search of a new place to eat or traversing the globe to climb mountains that they've only seen in magazines. Keep track your travels by scratching your way across the globe uncovering the countries and places you've visited. Track Your Adventures In Any Part Of The World! We at WanderLust Maps London produce maps with a highly detailed cartographic design, glossy laminating finish, beautiful colours and iconic landmarks across the globe.Track your traveling adventures, share stories with your beloved ones and reminisce all the good times. ✅ Looking for the perfect gift? Don't SCRATCH any further! This scratch off cartographic world map poster makes a wander-ful gift for anyone: loved ones, business partners or simply anyone who enjoys travelling (yourself included). ✅ Upgrade any wall. Whether is your living-room, children's room, dorms or your office space - This elegant decorative piece is guaranteed to complement and liven-up any boring old wall. 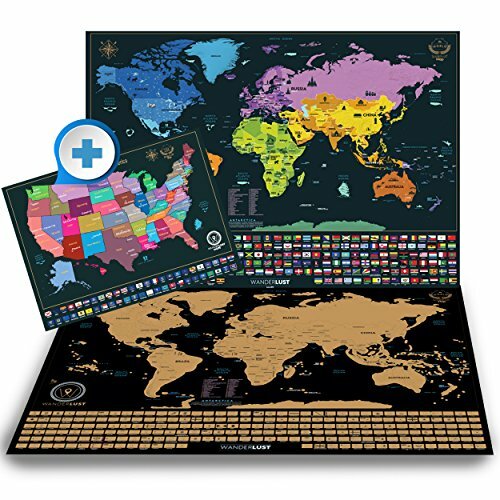 ✅ Made to last - Our scratch off world map was designed using a special coating layer to guarantee an easy and fun scratching experience without the risk of damaging the paper. The laminated and glossy finish protects the map against creases. ✅ All US state lines are clearly outlined for your extra convenience. Scratch all the states you have visited so far. NAME TAG GIFT PACKING – our gift packaging allows you to personalize your gift on the “From:” and “To:” section.  GORGEOUS US TRAVEL MAP - For a limited time only, for each scratch off map of the world purchase, we also offer a USA scratch off map. Including all US states and all state flags, the scratch travel wall map of the US challenges you to discover our beautiful country.  BONUS PERSONALIZED ACCESSORIES - We bundled in free accessories to enhance your scratching experience! Guitar pick scratcher for the best scratching experience and memory stickers to mark your travel memories. Showcase the style of travel with colorful stickers styled like cars and planes to mark your mode of travel. PERSONALIZED GIFT TUBE - The customized tube packaging has a special tag name where you can write down the receiver's name for a truly remarkable gift with a special "From: - To:" section to surprise anyone with your personalized gift. ❤ LIFETIME SATISFACTION GUARANTEE - You can return Wanderlust scratch-off map any time, and you will be issued a full refund.  EASY TO SCRATCH OFF - while other maps were found to be difficult to scratch off, leaving you with the feel of scratching a losing lottery ticket. Our scratch off world map utilizes top quality material that scratches easily and makes every scratch a winning one. If you have any questions about this product by W WANDERLUST MAPS, contact us by completing and submitting the form below. If you are looking for a specif part number, please include it with your message.